Oh boy, do I love Holly Thompson's books. After teaching in international schools for many years, in addition to teaching in Japan, there was so much to relate to here. The Language Inside is fantastic and an important read for third culture kids, the ones who don't feel like they fit perfectly anywhere. Emma is technically American, although she was raised her entire life in Japan and her nakami (filling) is Japanese. When her mother needs to have surgery for breast cancer, she and her family move to Lowell, Massachusetts. Emma feels guilty and caught between two worlds: wanting to be a supportive daughter in the US, but wanting to be part of the tsunami cleanup in Japan. I've lived outside the US for sixteen years and I know the pull of loving people in many countries. Add on the fact that I was actually in Lowell when I read this, and it was perfection. I miss having so much access to novels in verse. I love how Thompson uses it in The Language Inside. Emma suffers from migraines, which begin in the novel with a scattering of words, symbolizing the scattering of her thoughts. I also adore when novels feature a Caucasian girl falling for an Asian boy; this diversity is important and welcome. The last time I saw that was in North of Beautiful. It's been too long. 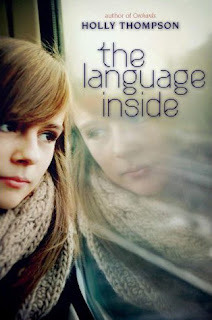 Although Emma is a teenager, I would recommend The Language Inside to older middle school students, and I believe it should be in every international school's library. I put this one on hold from my public library as soon as I saw your recommendation. Oh, so good! Definitely one that I'm recommending to my previous international school. I love narrative poetry and loved how many different "issues/topics" presented themselves in this book.